The Mt. Paran Church of God choir (in black), Grateful Hearts choir (in blue) and Mary Jane Theden (black dress with white stripes). Cindy Clements photo. On a rainy late September evening, a well-dressed crowd gathered in the great hall of a church on the northwest side of Atlanta to celebrate women who have recovered — or are recovering — from drug addiction. It was sponsored by an organization called Grateful Hearts. 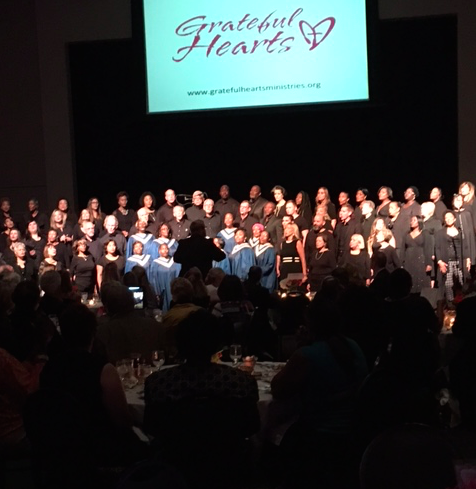 Grateful Hearts began eight years ago when three women from Mt. Paran Church of God went to the Atlanta City Detention Center to teach a Bible study class to the women incarcerated there. But one of the women — Mary Jane Stafford Theden — took it personally when she learned that not only were the women poor and victims of sexual, physical or emotional abuse, but also that they were in jail on drug charges. She had a family member with addiction issues, and the difficulty she experienced in her own life inspired her to help the women in jail. “I wanted them to know that God has a plan for them,” she told the audience. After several visits to the jail and in spite of her lack of credentials, Mary Jane asked the head of the jail to let her take one of the women and find a recovery program for her. He agreed. Although she had no way of knowing it, she was on the cutting edge of what has become a growing practice around the country — diverting addicts to recovery programs rather than jailing them at taxpayers’ expense. What began as a spiritual impulse became a ministry through the church and has gotten 65 women out of jail and into recovery. It has not only helped them deal with addiction, but also find work, reclaim their children and begin building self-esteem. The work is time-consuming and exhausting, and Mary Jane does almost all of it. While training to become an addiction counselor, she also appears in court with the women, finds programs for them, and takes them to medical and counseling appointments. She helps with their children, takes them shopping for essentials, even teaches them manners and appropriate behavior. When one of the women has a baby, Mary Jane visits her in the hospital because no one else does. And one night, she drove her white SUV with her white Golden Doodle in the back seat to Atlanta’s rough west end to rescue one of her women from a violent boyfriend. Grateful Hearts is on its own now, a 501-c-3 non-profit organization with a post office box of its own and an office — which used to be Mary Jane’s dining room. She has a part-time assistant, the help of a friend, Cindy Clements, and a seven-woman board of directors. At the fundraiser, she also had the assistance of several of her former University of Georgia sorority sisters. She was joined onstage by Lucy Hall who runs a recovery program for women called Mary Hall Freedom House. Lucy says that when one of her women relapses — her euphemism for it is “doing more research” — they inevitably call Mary Jane to get them back into Freedom House. But she does, and donations make it possible. Thus the fundraiser, which attracted a crowd that was a mix of black and white; Buckhead and metro Atlanta; middle-aged and older; privileged and middle class. There was a buffet, a video featuring Mary Jane and four of her women, and music by the remarkable Mt. Paran Church of God choir and the smaller Grateful Hearts choir. The event ended with the church choir singing while two lines of Grateful Hearts members and graduates — perhaps 25 in all — wound their way through the darkened hall, each of them carrying a lighted candle and a red rose. They joined the choir on the steps of the stage, their faces aglow with joy, transformed at knowing that they are important and loved. The audience rose and applauded long and loud, and cheered. Note: I’ve known Mary Jane for nearly 15 years, so I am not impartial. Although I’ve written about the event as objectively as possible, I have no hesitation about expressing my admiration for her devotion to God and my awe at what they have accomplished. For more information or to donate to Grateful Hearts, click here. This entry was posted in Uncategorized on September 30, 2016 by John Christensen.